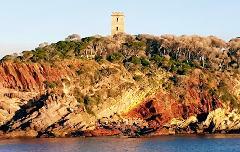 Take in the sights of Twofold Bay including Boyd’s Tower, Seahorse Inn at Boydtown, Edrom Lodge, the naval/multi purpose wharf, woodchip mill, mussel farms and Quarantine Bay. On most trips Cat Balou encounters dolphins or seals. See whales at Eden named Australia’s number 1 Whale Watching destination in Australia by Australian Geographic 2014! See whales at Eden named Australia’s number 1 Whale Watching destination in Australia by Australian Geographic 2014! A shorter version of whale watching which is a more suitable option for families with younger children. 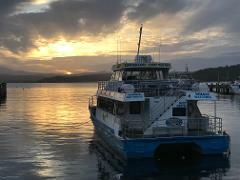 Soak up the tranquillity of Twofold Bay and take in the beautiful twilight skies from the water.